Archeological expeditions conducted in Karabakh region, once suspended due to the war, resumed in the last decade. During this period the number of archaeological expeditions increased in this territory. The six-year undergoing excavations in Agdam region revealed the unique items of high archaeological value perfectly preserved. Recently, the Institute of Archeology and Ethnography of the National Academy of Sciences reported about the new historical materials found during archaeological excavations at Neolithic settlement on Ismayilbey hill near Eyvazli village of Agdam region. 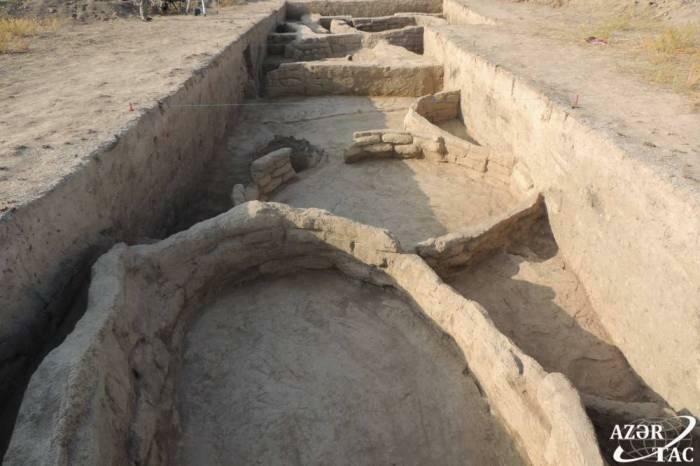 During the excavations carried out in the area, eight building remains found in oval, round and rectangular structures of the first half of the sixth millennium BC. The floor of these houses without entrance door and the inner surface of the walls have been plastered with mud mixed with red color. The floor part of the houses yard is covered with raw brick. Alter and head part broken small idol was found in one of the remains of the oval shaped building. Khaqani Almmamadov, head of the Karabakh Neolite-Eneolithic expedition at the Institute of Archeology and Ethnography of ANAS assumes that this building is the remains of the ancient temple. The skeleton belongs the ruins of the early Iron Age buried in the tomb of the woman was revealed in the excavation site. “The Ismayilbey hill located in the Karabakh plains, one of the earliest farming settlements of the Caucasus, is being investigated by the Karabakh Neolite-Eneolithic Expedition since 2012. Archeological excavations were carried out on the area of 400 square meters in the eastern part of the hill in 2012-2017. In the past period, 16 remains of building and more than 3,000 material culture patterns were discovered in the settlement. Since 2010, 289 monuments have been registered during the archaeological exploration of the Karabakh plain, of which 160 are ancient settlements. These monuments once again confirm that Karabakh is one of the world's centers of civilizations,” he said. In 2014, during the excavations carried out in the Karabakh plain, 8,000 years old building walls, sling stones and farm cubes were found. The height of the main wall is 3 meters 44 cm and its width is more than one meter. Moreover, two farm cube sizes larger than traditional dimensions and 52 large sling stones were found in the excavation. Along with the excavations, the archeologists have mapped more than 30 archeological monuments in Agdam, Agjabedi and Barda regions. In 2015, during excavations in Agdam region, as well as four pieces of cube, a child's grave and 200 sling stones were found from the house with a height of 3.40 meters, a diameter of 5.4 meters. The monument dates back 5,700 years before our era.